Do your ceilings lack overhead lights? You are not alone – many houses built in the 1960’s through the 1980’s’s in New Brighton were built with bedrooms and living rooms containing no overhead lighting. 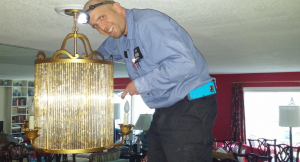 The good news is; installing wiring for your new overhead light fixtures may not be as difficult as you think! Back in the day, over sized table and floor lamps were very popular and it was cheaper to wire a home without overhead lighting. Now days homeowners want ceiling fans installed in the bedrooms, while opting for chandeliers in the dining area and recessed lighting in the living room. Installing recessed lighting in the living room is a great way to provide an even source of light while keeping a clean and open look. Even if your living room ceiling is pitched, we can install recessed lighting designed specifically for sloped ceilings. In most cases, adding the wiring for overhead lights or ceiling fans is a straightforward installation for our electricians. We always try to find a way to make the installation non-invasive to the walls and ceilings – in most cases, the wiring can be fished inside the walls and up through the attic space without the need for sheet rock repair.